The seeds for the tumultuous events of Amazing Spider-Man #121 and #122 were planted in Amazing Spider-Man #119. In that issue, Peter observes Harry saying goodbye to his father, when suddenly Harry collapses to ground. 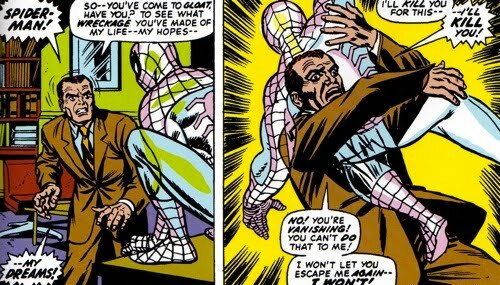 Peter tries to help, but Norman forcefully removes and yells at him claiming that "[Norman] is quite capable of handling this [himself]". The next time we see Harry it is in the pages of Amazing Spider-Man #121 where he is bed-ridden after overdosing on L.S.D. The family doctor, Ray, wishes that Harry were in a hospital where he could receive better treatment, but he respects Norman's wishes to keep this incident private. pider-Man tracks the Goblin to the Brooklyn Bridge (although Peter refers to it as the George Washington Bridge) where his recent contraction of a head cold becomes a liability. Peter was not able to muster up enough strength to deliver the knock-out blow to the Goblin, allowing the villain to quickly recover from Spidey's attack. Just as Peter reached Gwen, the Goblin sneaked up and knocked the 'doomed' girl's unconscious body from atop the bridge. Spider-Man attempts to save his falling girlfriend by sending a web line down to catch her. He succeeded and was at first thankful for his wonderful web-shooters. Unfortunately, he quickly realized that the sudden jolt from the web line had snapped her neck, leaving the Goblin as well as himself responsible for her untimely death. The story ended with the Green Goblin taunting Spider-Man over Gwen's death and then promising him to be next! 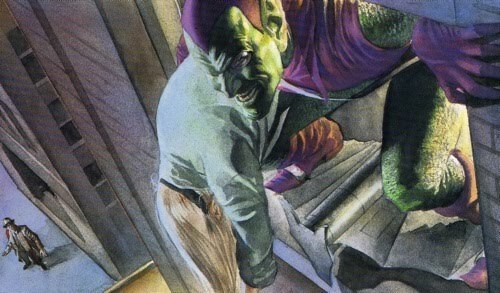 In Amazing Spider-Man #122, Spider-Man, enraged by the Goblin's brutal plan, continues fighting him on the bridge. 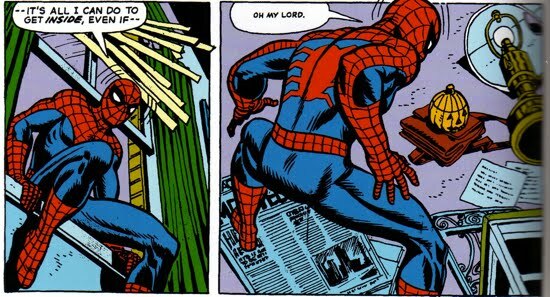 But Spidey's fury blinds him and he gets sloppy is knocked out by a bridge cable, allowing the Goblin to escape. 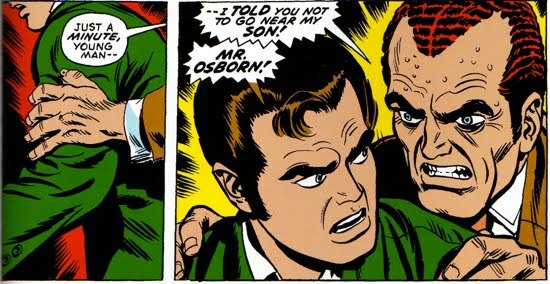 Peter returns to the Osborn estate but does not find Norman, only Harry. Harry pleads that Peter stay with him, but Peter, set on revenge, ignores his friend's request. 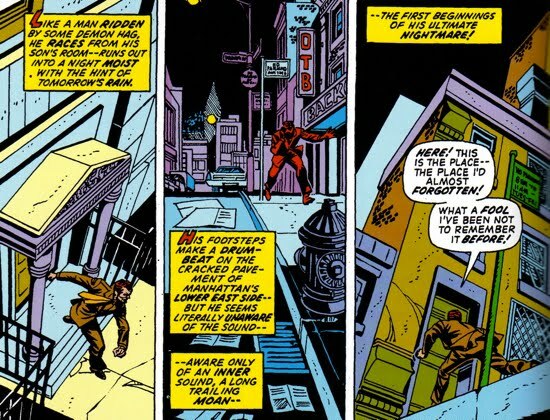 Peter then heads over to the Daily Bugle where he luckily receives a tip from Joe Robertson that leads him to a Goblin hideout. When Peter arrives he finds Norman, who is anticipating the arrival of his mortal enemy and he is prepared to kill him too. 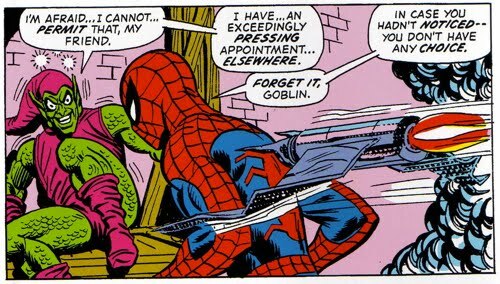 In the ensuing fight, Spider-Man is able to subdue the Green Goblin, but the Goblin sends his glider to attack Spider-Man from behind. 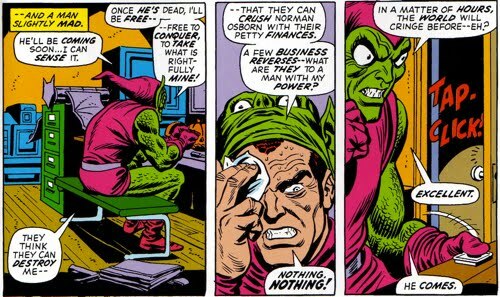 Spider-Man ducks to avoid the glider and the Goblin is impaled, causing his “death.” Peter feels no retribution in watching the Green Goblin die and he leaves Norman's lifeless body behind still garbed in the Goblin costume. However, there is a mysterious figure watching all these events transpire and who will play a pivotal role in maintaining the legacy of the Green Goblin. The mysterious figure is later revealed to be Harry Osborn. Harry's attempt to redeem his father is outlined HERE. Another wrinkle gets added to this tragic tale when one considers the events of Amazing Spider-Man #509-514, aka Sins Past. During Sins Past, Peter discovers an affair between Gwen and Norman that resulted in the birth of a twin son and daughter. This helps Peter to realize why Norman targeted Gwen in the first place, since there were many people that Peter held dear to him. 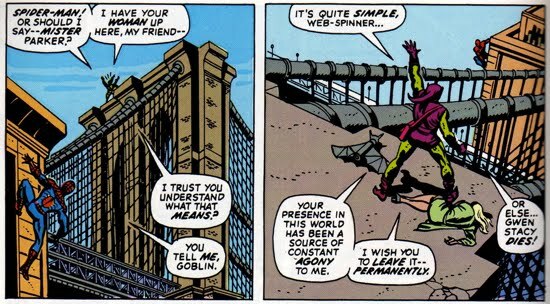 It also helps to answer the question as to whether Gwen was just in the wrong place (Peter's apartment) at the wrong time or whether the Goblin actually sought her out intentionally during Amazing Spider-Man #121. He most likely abducted Gwen purposefully, because she had told him that she wanted him to have nothing to do with raising these children. Prior to her death, Gwen had told Norman that she would have Peter help raise the children and that he was the "only man fit to raise these children." This most certainly caused Norman to harbor increase resentment toward Peter, since Gwen had desired him to be the "father" to his children. In Marvels #4, one part of a retcon series by Kurt Busiek and Alex Ross, photographer Phil Sheldon witnesses both the Green Goblin leaving the apartment with Gwen Stacy and her death on the bridge. Phil was on a mission to help clear Spider-Man's name from the death of Captain George Stacy, which is why he was in contact with Gwen around the time of her death. The callousness of the public response to Gwen's death along with witnessing a Marvel fail causes Phil to retire from photojournalism and pass the mantle to his assistant. The moments following Gwen's death were chronicled from the perspective of one of the police officers that witnessed the tragedy in a retconned story featured in Peter Parker Spider-Man (V2) #26. After the Green Goblin fled the Brooklyn Bridge, Spidey returned to Gwen's lifeless body and held her in his arms. Two cops approached the web-slinger, but he reacted violently toward the officers forcing them to back off. 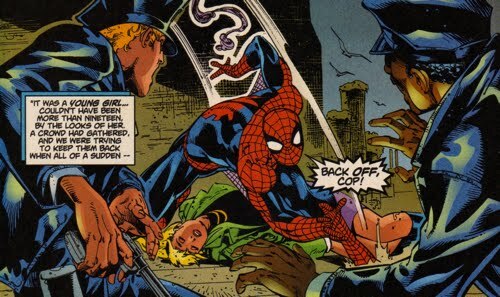 As one of the police officers recalled the events of that day, he noted that Spider-Man took Gwen's death very personal. The officer felt sorry for Spidey and when he saw Peter Parker later on at the police precinct, he told the young photographer that Spider-Man did his best to save Gwen. Peter thanked the cop, who later admitted that he was glad that Spider-Man is 'on our side'. This particular retcon begs the obvious question. 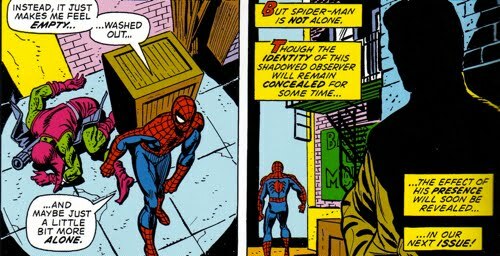 If the cop noticed just how personal Spider-Man took the death of Gwen Stacy, how could he not eventually piece together Parker's alter ego? In Amazing Spider-Man #121 Spider-Man refers to the Brooklyn Bridge as the George Washington Bridge and even goes further to say that Norman took her to this bridge because George Washington was his favorite president. Future books refer to it as the Brooklyn Bridge. The interior art of Amazing Spider-Man #121 looks more like the Brooklyn Bridge than the George Washington. The best way to rationalize this discrepancy is to assume Peter mistook the bridges. One can't deny that the bridge Gwen Stacy was thrown from was the Brooklyn Bridge (the art doesn't lie!). 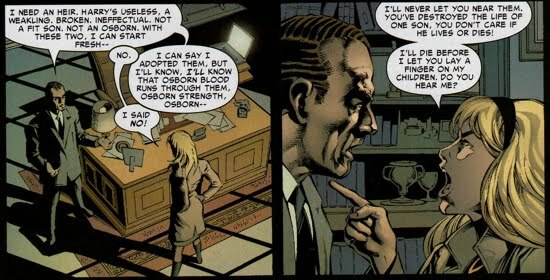 Moreover, when Norman Osborn used Mary Jane as a hostage in Marvel Knights Spider-Man #11, Norman specifically says that he's choosing a 'different bridge' for that occasion. The bridge depicted in the Marvel Knights story is the Georg Washington bridge. That scene settles the debate. 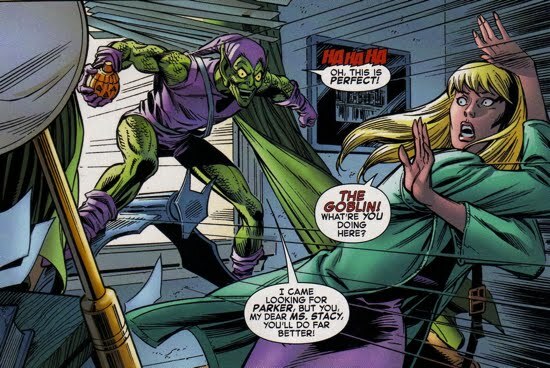 The death of Gwen Stacy was one of the Green Goblin's crowning achievements and Carlie Cooper witnessed just how much Norman loved to talk about this horrible day in Superior Spider-Man #31. The good ol' days, huh? Doesn't get much more deplorable than that. 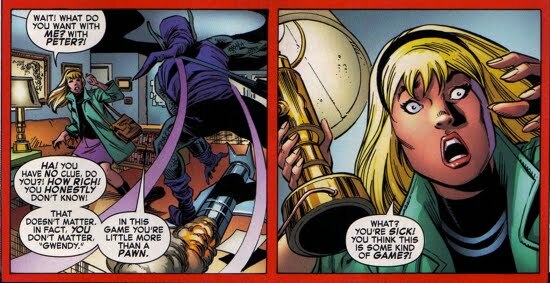 It seems as though the Death of Gwen Stacy storyline is basically an onion that continues to unravel layer by layer throughout the years. The latest installment of Addendums to the Death of Gwen Stacy comes from the Clone Saga V3 aka Dead No More: The Clone Conspiracy #1-5. During The Night I Died (the second story from Dead No More: The Clone Conspiracy #1) more of the details of Gwen's abduction prior to her death in Amazing Spider-Man #121 are portrayed. 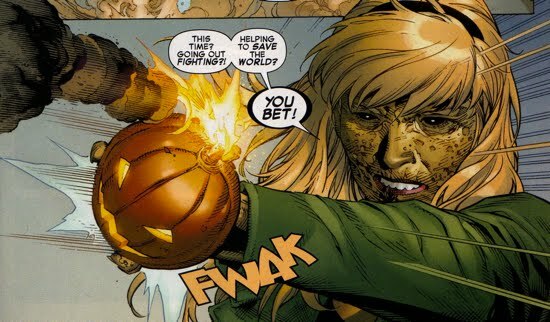 Gwen learns from the Goblin's ramblings that she is a pawn in a personal war between he and Peter Parker. 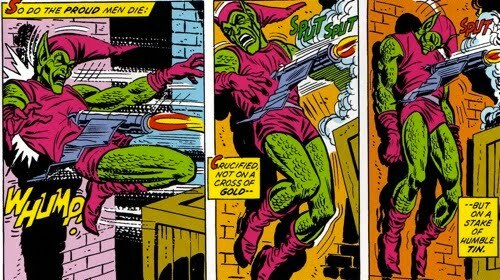 The Goblin also mentions that she is the "thing" he will use to "finally destroy Spider-Man." This was the first clue that Gwen's world was about to be turned upside down. Later, Gwen finds herself slowly returning to consciousness atop the Brooklyn Bridge as a battle between Spider-Man and the Green Goblin rages on. Its at that point that Gwen hears the Goblin refer to Spider-Man as Peter Parker. Gwen's feelings immediately turn to betrayal as she realizes that Peter had kept that secret from her "all this time." Then, as we all know, Gwen is thrown from the bridge and dies as her neck snaps from the jolt of the web-line that Peter had fired in order to save her. The significance of the Clone Conspiracy storyline is that Gwen is resurrected with all the memories she had prior to her death. Gwen and Peter have a chance to share a moment in Amazing Spider-Man (V4) #23. 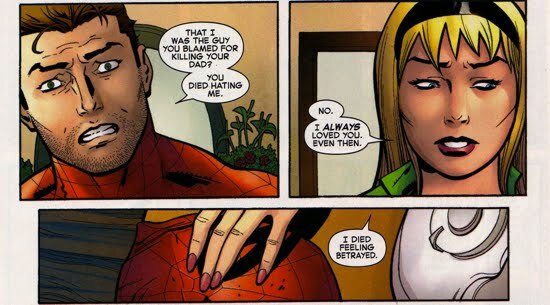 During their alone-time, Gwen tells Peter that she did not 'die' hating Peter but rather having felt betrayed that he never confided his secret with her. But she understood why Peter kept his secret and she forgave him. Some quick thoughts on this revelation from Dead No More: Clone Conspiracy regarding Gwen's death. First, in Marvels #4, Gwen explained to Phil Sheldon that she hated Spider-Man after her father had died; she questioned whether "there was a face behind his mask." But then she goes on to say that she didn't quite feel the same way anymore. Of course, she dies the next day. The point being that her lack of anger with Spider-Man in Clone Conspiracy story arc is completely inline with her sentiment in Marvels #4. One storyline that becomes a little more shaky with this revelation is the infamous Sins Past storyline. One of the layers added to the mythos from that arc was that Gwen may have been (probably was?) targeted directly by the Green Goblin because she had just denied Norman any contact with the twins she had recently given birth to. However, in Dead No More: Clone Conspiracy #1 Norman makes it very clear that she was simply a pawn. In fact, he says it a few times and it really reads as of the infamous Stacy twins were not on his mind at all as motivation for this attack. There's lots of ways to explain away that tone, but nevertheless this story did not directly reinforce the Sins Past arc...perhaps thats a good thing? One final takeaway from this addendum is the level of tragedy that this story takes on once you realize Gwen was not unconscious at the Brooklyn Bridge that day. The fact that Gwen was awake adds another layer of brutality to her murder and makes her death even more chilling than originally believed.